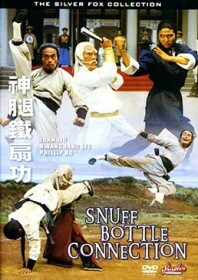 A riotous kung fu yarn in which Ng See-yuen reunites his Secret Rivals discoveries John Liu and Hwang Jang-lee under the blistering choreography of fledgling filmmaker Yuen Woo-ping. A Russian envoy (Horan, looking like the fourth Bee Gee) is sent to a Manchu stronghold in a Chinese outback as a guest of the Magistrate, but his motives are unclear. His comrades start roughing up the locals and an undercover court official is killed, so supercop John Liu is called in to investigate. He buddies up with the smooth-talking parochial pickpocket Yip Fei-yang who finds himself in possession of a jade snuff bottle linked to the Russians. Government officials are seen appeasing the foreign troublemakers and Chinese traitors are unearthed, including the double-crossing commander played by Hwang Jang-lee (of course). To make matters worse, Hwang has mastered the Iron Fan technique and devised the top secret Snake-Hawk style. Keep checking the background for recognisable faces including Chien Yuet-san, Yuen Biao and Corey Yuen, all of which get repeatedly pummeled to the ground in early extra work.